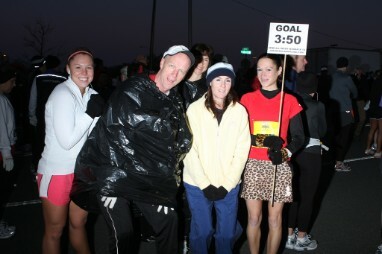 Jenni is one of our friendliest Pacers! To break 2:50 and run a marathon in every state. Because I can…Because I never made the basketball or volleyball team…And because nothing gives me the same satisfaction that I feel after an awesome workout or race. My debut marathon in Chicago 2005. I had a lot of support on the course, ran negative splits(4 min less the 2nd half) and it felt easy until the last mile. I was talking the whole time! Because I love being around other runners and I love helping people, so this way I get to do both. Grand Rapids. I paced with 2 other guys and we had a blast. That race has celebrity pace group names so it gives it a fun twist. Because it takes the pressure off of running even splits on your own. It makes the miles fly by and makes it fun with the whole group comradery. Sharing stories and experiences with other runners is awesome. Ask lots of questions, don’t be afraid to be vocal and cheer for others around you, and run the first half totally relaxed. If you feel like it is hard early on, you are probably going too fast. Also, don’t wait till the 3rd water stop to get fluids! Have more than just one goal, that way you will never be too disappointed. Have FUN!! !